The liner notes concede the obvious about Julius Bittner. He was heavily influenced by Richard Wagner. Bittner was a contemporary of Franz Schreker, Erich Wolfgang Korngold, and Franz Schmidt. And while his music shares the Viennese richness of his contemporaries, there’s still more than a hint of Wagner. As Brendan G. Carroll relates in the liner notes. “[Bittner’s] predilection for lavishing the richest possible instrumentation on even the slightest operatic material led to some typically Viennese barbs that were nevertheless made with much affection. That Wagnerian streak and Bittner’s gift for rich orchestration is readily apparent in the two works presented here. The 1911 symphonic poem Vaterland is a musical valentine for Austria. This short work is full of beautifully crafted melodies that flow seamlessly together. That is, they do until the music comes to a full stop and a solo organ solemnly plays “Ein feste Burg ist unser Gott.” The orchestra reenters, picking up and developing parts of the melody, which builds to a rousing finish. As a celebration of the Austrian (read: Vienese) musical spirit, it’s a wonderful work. So too is the 1923 Symphony in E minor. The work has a fairly tight four-movement structure of a Brahms symphony, with the fluidity of a Wagner orchestral work. Bittner orchestrates his themes with resourceful imagination. The grouping of instruments is just as important to the development of his themes as the keys they move to. 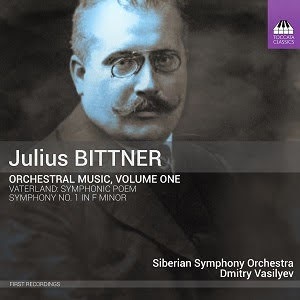 Dmitry Vasiliev and the Siberian Symphony Orchestra do Bittner’s music credit. The ensemble is well-recorded, letting us hear the subtle details of Bittner’s orchestrations. And while not Viennese, they seem to capture the essence of the style in these performances. Although Bittner was a popular and prolific composer, only a handful of his compositions have ever been recorded. Toccata Classics is doing the music world a real service by launching this series of orchestral recordings.